EDINBURGH, Scotland, April 15, 2019 (ENS) – A smartphone device developed at the University of Edinburgh could help millions of people avoid arsenic-tainted drinking water. Water contamination by heavy metals is a worldwide health issue, and arsenic is one of the main dangers. UNICEF reports that drinking water contaminated with arsenic is consumed by more than 140 million people worldwide. Arsenic is linked to 20 percent of all deaths in the worst-affected regions. Long-term exposure to unsafe levels of arsenic leads to skin lesions and cancers. The association between chronic arsenic exposure and cancer is strongest for skin, lung, and bladder cancers. Now University of Edinburgh researchers have developed a biosensor that attaches to a phone and uses bacteria to detect unsafe arsenic levels. The device generates easy-to-interpret patterns, similar to volume bars, which display the level of contamination. Researchers tested the arsenic sensors using environment samples from affected wells in Bangladesh, which suffers from some of the world’s highest levels of arsenic-contaminated groundwater. 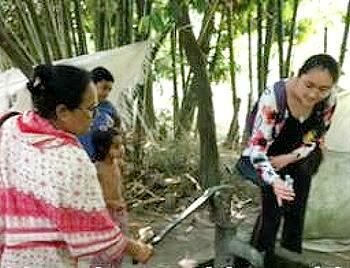 An estimated 20 million people in Bangladesh, mostly poor people in rural areas, drink contaminated water. “We tested our sensors with samples from wells in a village in Bangladesh. The arsenic levels reported by the sensors was consistent with lab-based standard tests, demonstrating the device’s potential as a simple low-cost-use monitoring tool,” said lead researcher Dr. Baojun Wang of the University of Edinburgh’s School of Biological Sciences. Dr. Wang heads the Synthetic Biological Circuit Engineering Lab at the University of Edinburgh, working at the interface between biology and engineering. The biosensor was developed by manipulating the genetic code of the bacteria Escherichia coli, known commonly as E-coli. The scientists added genetic components to act as amplifiers when arsenic is detected in the water. There is an urgent need to provide simple, affordable, on-site solutions for contaminated water sources, the University of Edinburgh researchers point out. In resource-limited countries, there is a lack of skilled personnel and healthcare facilities to test water for contamination. This and other new technologies could replace existing tests, which are difficult to use, need specialist laboratory equipment and can produce toxic chemicals, the scientists said. The University of Edinburgh scientists believe that this approach also could be used to detect not only arsenic but other environmental toxins, diagnose diseases and locate landmines. Published in the journal “Nature Chemical Biology,” the study was funded by the Leverhulme Trust, the London-based biomedical research charity Wellcome, and by the Biotechnology and Biological Sciences Research Council, part of UK Research and Innovation, the largest UK public funder of non-medical bioscience.